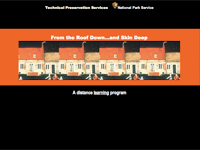 Technical Preservation Services has created web-based training features to provide professional development alternatives and enrichment programs for professional preservationists, local preservation commissions, volunteers, and anyone interested in more in-depth training in historic preservation. 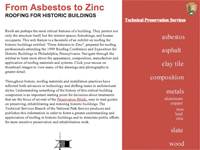 These training features provide guidance on preserving, restoring, and rehabilitating historic buildings. 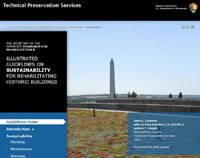 These guidelines offer specific guidance on how to make historic buildings more sustainable in a manner that will preserve their historic character and that will meet The Secretary of the Interior’s Standards for Rehabilitation. Also available in PDF format. 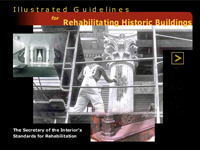 Illustrated guidelines specific to the Secretary of the Interior's Standards for Rehabilitation provide general design and technical recommendations during the project planning stage. Also available in PDF format and sold in printed format. 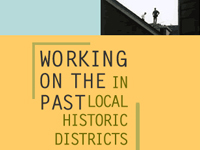 Clear, detailed information to assist historic building owners, preservation consultants, community officials, and architects planning historic preservation projects. 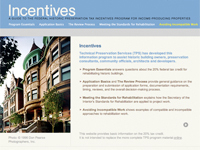 “Avoiding Incompatible Work,” provides illustrated examples of tax credit projects that met, or did not meet, the Standards for Rehabilitation. 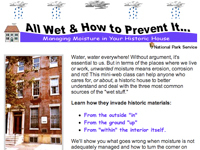 Learn how the “skin” of your historic house functions, how to keep surfaces and features in good repair over time, and what happens if you don't. 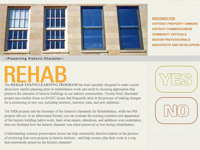 Brief case studies focus on issues that frequently arise during rehabilitation projects. Evaluate the existing conditions, learn what repairs, alterations, and additions were undertaken, and see how the historic character was preserved or lost. Understand the history of roofing, an important building component, and learn more about the appearance, composition, manufacture and application of roofing materials and systems. 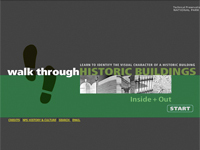 This web class helps identify those tangible elements or features that give historic buildings their unique visual character. This tutorial outlines the legal strengths of local historic districts, describes the local preservation ordinance, discusses the benefits of local design guidelines, and makes clear the essential differences between preservation, rehabilitation, restoration, and reconstruction.